Let’s start by taking a look at the different gauge currently available for tennis string. As I mentioned tennis string gauge is the thickness of a string, therefore we can get the measurement simply by taking the diameter of the string. The following table outlines the different types of string gauge currently available. Depending on where you live you may see the measurements represented in two different ways on the packaging. In the US string gauge measurements can be a bit confusing for players at first because the number representing the gauge is counterintuitive. As you can see from the table above the higher the gauge the thinner the string and the lower the gauge the thicker the string. If you don’t live in the US you’ll typically find string gauge represented in millimeters (mm), however players in the US will also find it helpful to know these measurements as not all manufacturers will list the gauge 19-15 on their packages. The most common measurements and therefore widest selection of strings that you’ll find available are 17, 16L and 16. While there are certainly strings available outside this range most players tend to fall within this range when stringing their racquets across many different types of string. Helpful tip: it’s important to note that the above measurements are guidelines, which most manufacturers will follow. However, from time to time you will come across strings sets that are labeled outside of these recommendations, so it can always be helpful to check the package so you know what you’re using. Of course, knowing string gauge isn’t all that helpful if you’re not clear on exactly how the thickness of a string impacts performance. 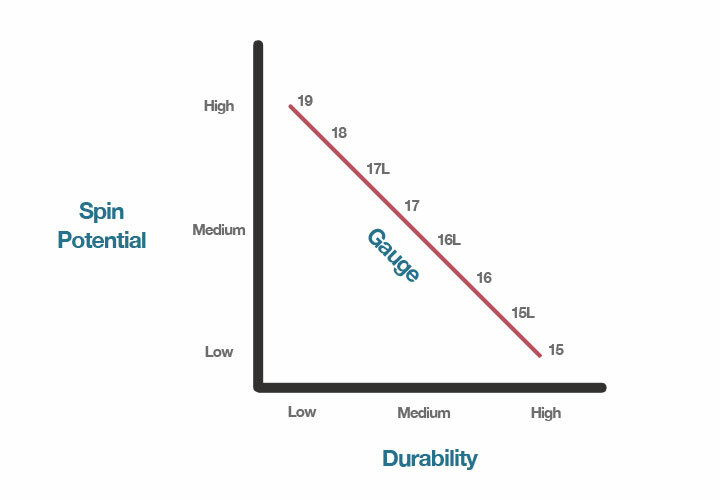 There are two main factors players usually consider when selecting a string gauge: durability and spin potential. Typically the heavier the gauge or thicker the string the more durable and long lasting that string will be. When you play tennis your strings produce friction at the cross-sections where they overlap each other. Over time you’ll notice that your strings cut into each other and begin to notch, so naturally the thicker they are the longer they’ll last. Thicker strings can also withstand greater impact, which helps extend the life too. All else equal, thicker string are more durable and it’s a great rule of thumb to use when evaluating strings. Beyond durability players also rely on their string gauge to influence their potential for generating spin. The thinner the string the more potential for spin, while the thicker the less potential for spin. This is due to the fact that thinner strings can bury themselves deeper into the ball and as a result “grab” the ball, which results in more spin. The thicker the string the lower the ability for string to do so resulting in less potential for spin. However, just because you have thin strings doesn’t mean you’re going to generate massive spin. It’s one of the many factors that can influence spin, but your grip and technique will have much greater influence over spin. Every player is different and so are their needs and preferences. Recognizing this, it can be helpful to consider the following factors when evaluating string gauge. If you’re brand new to tennis then I would typically recommend players go with a thicker string. When you’re just getting started you’ll unlikely be able to notice the nuance differences between a higher or lower gauge string. However, you will be likely to appreciate the extra durability of a lower gauge string. Recognizing this I’d recommend 16 for most new players. If you’re intermediate to advanced then I’d recommend players go thinner and experimenting with different gauges. A great place to start is 17 and then you can move up as you feel comfortable. If you can’t afford to string your racquet frequently I’d also recommend you string with a lower gauge string to help avoid breakage and increase the longevity or your strings. Racquet stringing can be expensive especially when you take into consideration the labor to string your racquet. You can go thicker, but 16 will usually do the trick while helping maintain good solid playability and potential for spin. Another factor to consider is frequency of play. If you’re only playing twice a month then you might not be as concerned with longevity so you may be comfortable stringing with a higher gauge. After all, you’ll still want to replace your strings on a semi-regular basis since strings naturally lose their tension and liveliness over time. On the other hand, if you’re playing 5 days a week and you can’t afford to restring every week then you might want to use a lower gauge to increase the life of your strings. String manufacturers always label their strings either with the gauge or by specifying the measurement of the strings. Here are a few examples of string packages with the gauge of the string highlighted. Depending on your personal preferences you may choose to use one string gauge or another. As you progress it can be helpful to experiment with different gauge tennis strings especially within the same type of string as performance will vary. What gauge tennis strings are you using and why? Let us know in the comments below! What strings & tension stay freshest the longest. As far as tension goes natural gut strings will stay fresh or lively for most any racquet when strung roughly within the tension recommended by the racquet manufacturer. You can find this recommended tension within the throat of most tennis racquets. If you’re looking for a new set of strings you might want to check out our article on the different types of tennis string.